Photo taken by author. 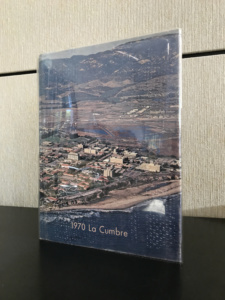 1970 La Cumbre yearbook located at Special Collections, UCSB Library. Let me take you back to your senior year of high school. What mattered the most? Prom? Grad-night? Graduation? All of these things, I’m sure. However, the one long-lasting item that you and many seniors may have been eager to have was the yearbook. For the seniors who buy them, yearbooks function as a way to look back at their final year of school. All the memories made throughout the year are captured throughout the pages, and friends sign the back promising to “keep in touch!”. Nowadays, yearbooks are typically associated with high school — however, there was a time when yearbooks were a key aspect to colleges everywhere. Here at UCSB, La Cumbre was the long produced yearbook dating back 91 years from it’s last production in 2011. Photo taken by author. Special Collections, UCSB Library. It featured many similar aspects to modern-day high school yearbooks, including the sections for the dedication, academics, campus events, and seniors. However, yearbooks of the past — such as the 1970 edition of La Cumbre — went beyond the format of yearbooks we know of today. This particular yearbook featured coverage of political activism that broke out on campus during this time. 1970 was a year of rebellion, and the main event of the time that sparked outrage in students everywhere was the Vietnam War. At UCSB, one of the major acts of defiance the students executed to display their lack of support for the war was the burning down of the local Bank of America in Isla Vista. For some students and many older adults at the time, this event could be seen as kids simply being out of control. For many other students, this was a symbolic act in which they stood up for what they believed was right, taking down a prominent structure which represented capitalism and the government which was failing them. 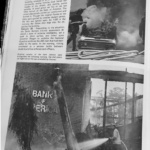 The story of the burning of the bank is being told in the yearbook through a student perspective. There’s two sides being shared in the yearbook article: on one hand, the first thing a student reads on this page is “violence in Isla Vista”, and another key word with a negative connotation throughout the piece is “rioting”, versus the use of a more activist-related word such as “protesting”. The use of these negative words might suggest the disapproval of this event. On the other hand, the mere presence of this event in the yearbook is very significant. The 1970 graduating class is choosing to include this event in their story, therefore choosing to be remembered by this. The UCSB class of 1970’s collective memory of this event is very evident in this yearbook. They are not entirely critical of this more aggressive approach to activism, but instead, are celebrating it. When graduating, yearbooks bring memories still fresh in a senior’s mind back to life. As decades pass, the function of a yearbook changes. The book is no longer an autobiographical memory book, but instead becomes a genuine depiction of a past generation. Eventually, a yearbook will no longer serve it’s original autobiographical purpose, but will be used to preserve the legacy of the graduating class. Being that this specific yearbook (among others) is kept in the Special Collections at the UCSB library, it goes to show that the function of this yearbook has become one of an artifact. And so, maybe the political aspect of the yearbook isn’t so out of the ordinary after all. The activism covered in the yearbook effectively represents the 1970 class, both for the seniors of the time to hold on to and for people decades later to remember them by.